Time Magazine Gets Guns Right! Time Magazine interviewed 245 people on one of the nations biggest political topics. Guns In America. Time got together with the acclaimed Muralist @jr, who is known for his murals that portray complicated social issues, to photograph and film 245 Americans in an effort to cover both sides of the discussion over guns in America. Among those interviewed are gun owners and enthusiasts, Activist with opposing views, Doctors, and policy makers. Each of these individuals were given a 3 minute slot in order to share their thoughts on the topic without interruption. The exhibit will travel the country as an 18ft video mural visiting various museums and institutions. If you visit Times website you can click on each person and hear their story. As you can imagine some people were a bit hesitant to talk to time with concerns that their words would be changed. The participants signed a contract stating that TIME could edit their words however Time pleased though again reassured everyone their words would not be twisted or misconstrued The photos were shot in a green room. Each individual posed with their firearms in a variety of positions. After the photo shoot each individual participated in a 3 min audio session in which they were able to voice their opinion about the gun issue in america. Some were even invited to shoot a video session afterward. HMFIC TJ Kirgin aka Sig Glockncolt was chosen, along with others, to represent his thoughts about the debate over guns in America. His picture, and story will be featured in a fold out cover of TIME coming to news stands. Other Familiar Faces Like Corinne Mosher (Competitive Shooter), Amy Robbins ( Alexo Athletica) Kevin Dixie (N.O.C. Firearms), Dianna Muller (Founder of The D.C. Project) Antonia Okafor (EmPOWERed), and Taj Toure (Founder of Black Guns Matter) were also featured in the article to tell their story. @jr lived up to his word and delivered an art project at a magazine feature that brings both sides of this discussion together and allows us to speak our minds without interruptions from opposing views. We urge each and everyone of you to visits Times page and click on every one of the 248 people and listen to their story even click on some of the other folks that appear to be in opposition of your views and let your mind open a bit. 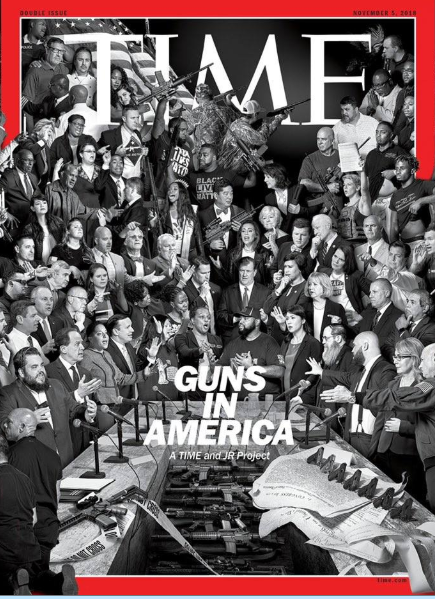 TJ Kirgin aka Sig_Glockincolt on Time Magazine Cover! 11 dead and 6 wounded in Synagogue shooting.